Senior broadcasting, telecommunications and mass media major Aaron Wolf, got involved in Greek life his first semester freshman year. Now, four years later, he is the president of Temple University Greek Association, while managing an internship, a full load of classes and a job at the same time. Throughout Wolf’s time in Alpha Epsilon Pi, an international Jewish fraternity, he said he gained leadership experience and networked a lot. Although Temple doesn’t have the largest Greek presence, Wolf has made the most of it, and talked about how being in AEPi has enhanced his college experience. The Temple News: How did you get involved in Greek life? 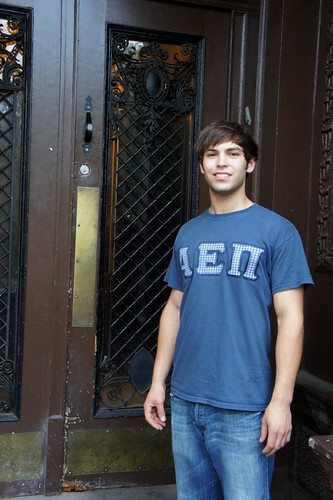 Aaron Wolf: To be honest, I never thought of Greek life. Throughout high school, I didn’t even know what rushing was or how you get in, but eventually I got to school and I was contacted immediately by this guy Jon Kriner–my rush chair. Since it’s a Jewish fraternity, they look for Jews, that’s part of our values. That was one of the big turn-ons for me because I’m Jewish and I’ve always been friends with Jews and this definitely doesn’t apply to any other fraternity. I met a few kids during rush, and I liked the people there. I rushed right away, which is the best way to do it, honestly, because you get the most out of it. I ended up diving headfirst into this whole fraternity thing, really not knowing what I was getting into, and ended up loving it. And now here I am, the president of Greek life, which is insane. It does a lot for you leadership wise. TTN: When did you become TUGA president? AW: Just this past spring I ran. They have elections in May, so I’ve been the president all summer. There hasn’t been much to do [in the summer], so really I just basically started this week. I thought I was a little crazy for doing it my senior year, but it’s something that will help me grow as a person. TTN: What have you been doing this first week to prepare for the year? AW: We’re planning a block party, which should be in early October for Greeks and the Temple community to come together. We’re just in the early stages of planning our events, that’s really what I’ve been doing. TTN: Do you have any advice for people who are looking to join a fraternity or sorority? AW: Obviously, I say go for it. I think that it’s really, really important to go out there and meet everyone, like every single fraternity, unless you really find the one that’s for you. If you feel like it’s for you, and you really like the people there, then it probably is. I don’t really agree with the people who just join for the parties and the free alcohol and stuff. You should really be looking for something more. You’ll leave the organization and not really feel like your part of something. TTN: What do you think has been the most rewarding experience you’ve had since being part of Greek life? AW: Being president. Also, AEPi offered a free spring break to California. I was doing community service in Compton and Watts. I worked with an organization and we helped build a community service building that is for the locals for kids to go and play–kind of like a day care–an after school thing, so they’re not in the streets. It was a fun, brotherly experience. TTN: When you think back on your experience being in a fraternity, what have you gotten the most out of it? AW: Networking is something you really learn. It’s not just your fraternity, it’s your fraternity and sororities and other fraternities, so you already have a bond. I’ve met a lot of people, more so than I would have if I didn’t join. TTN: Why do you think Greek life is special at Temple? AW: Temple’s Greek life is pretty interesting because it’s not really a large percentage [of the student body]. Everyone that’s part of it really cares about it, and feels like they have a place. Fraternities aren’t something that everyone goes out for here. Lauren Hertzler can be reached at lauren. hertzler@temple.edu.